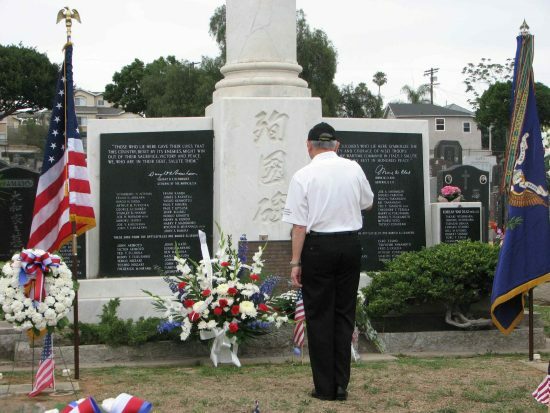 The Nisei Veterans Coordinating Council held its annual Memorial Day service on May 30 at Evergreen Cemetery in Boyle Heights with veterans of World War II and other conflicts as honored guests. 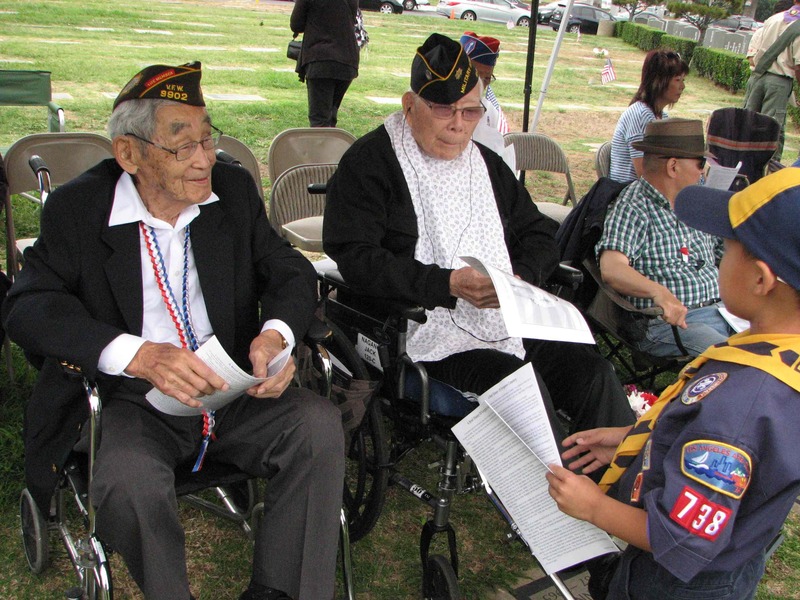 Above: The oldest vets in attendance were Jack Kunitomi, 100, and Jack Nagano, 98, pictured with one of the Koyasan Boy Scouts participating in the ceremony. Rev. 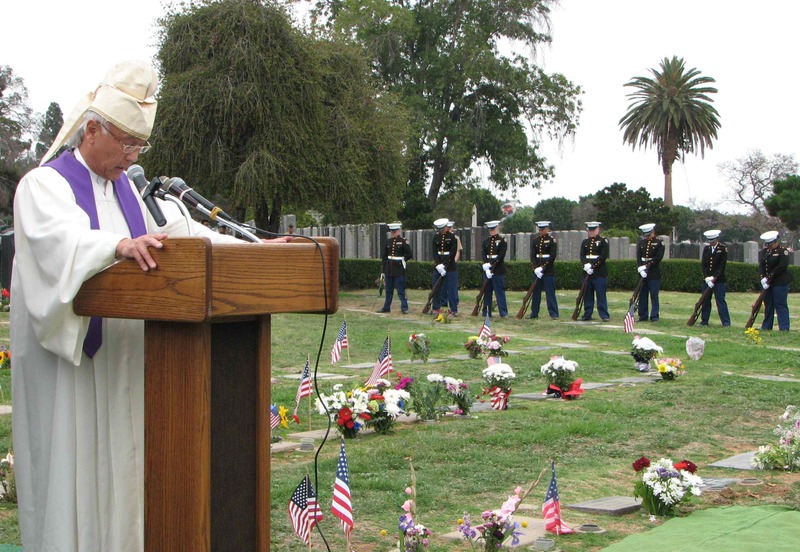 Dr. Alfred Tsuyuki of Konko Church of Los Angeles gave the closing meditation after the Marine Corps Jr. ROTC cadets of Redondo Union High School fired a volley. 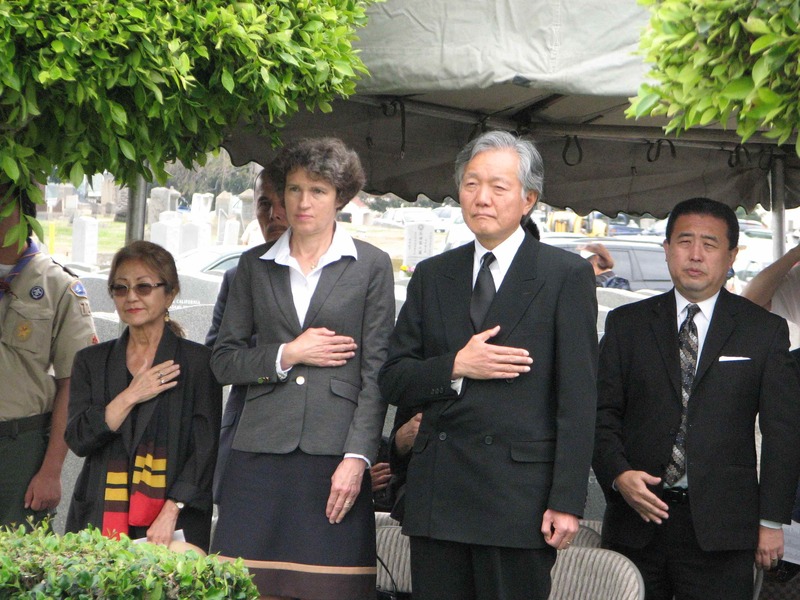 Left: Judge Vincent Okamoto, a decorated Vietnam War veteran, gave the keynote speech (see below). Right: Rev. Dr. Richard Kuyama of Centenary United Methodist Church gave the invocation. 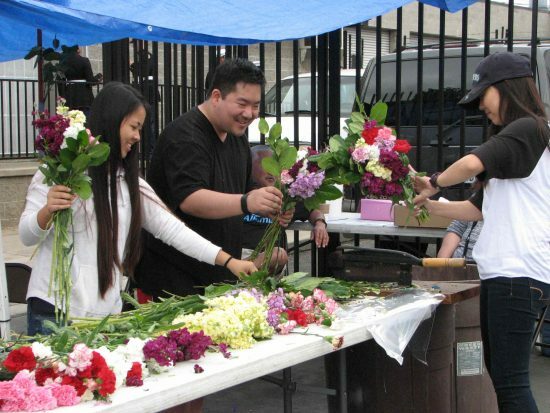 Flowers were sold to raise funds for the Los Angeles Buddhist Coordinating Council Summer Camp. Among the organizational representatives giving floral tributes were (from right) Howard Miyoshi, chairman of the Memorial Preservation Committee; Consul General Harry Horinouchi and his wife, Sabine; Kitty Sankey, president of the Japanese Chamber of Commerce of Southern California. 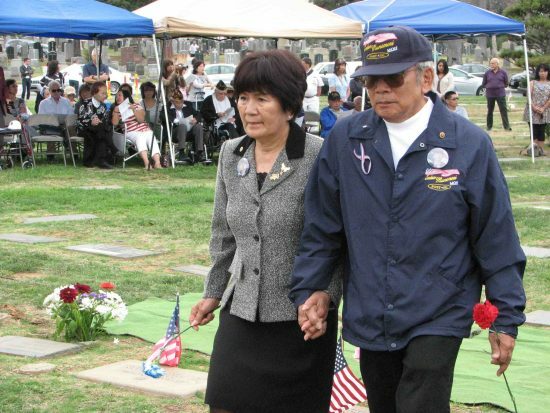 Paul and Yoko Nakamura, who lost their son in the Iraq War, participated on behalf of gold star families. Ken Hayashi, president of the Veterans Memorial Court Alliance, pays his respects at the monument to Nisei soldiers. Floral tributes were also made by Sally Hamamoto, gold star families; Commander Gary Sakata, Sadao Munemori Post 321; President Ken Shigemitsu, 100th/442nd Veterans Association; Tohoru Isobe, Military Intelligence Service Veterans; Past President Min Tonai, Japanese American Korean War Veterans; Rev. Junkun Imamura of Koyasan Buddhist Temple, Buddhist Federation of Los Angeles; Rev. 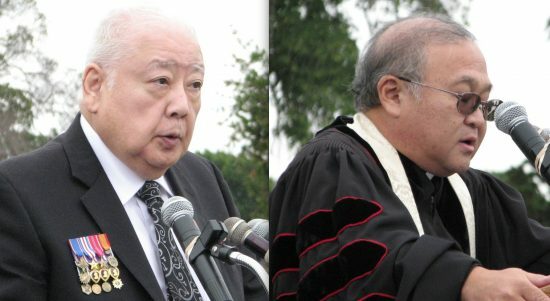 Dr. Richard Kuyama, Japanese American Church Federation; Yoshiko Yamaguchi, Japanese Women’s Society of Southern California; President George Mori, Nanka Kenjinkai Kyogikai. 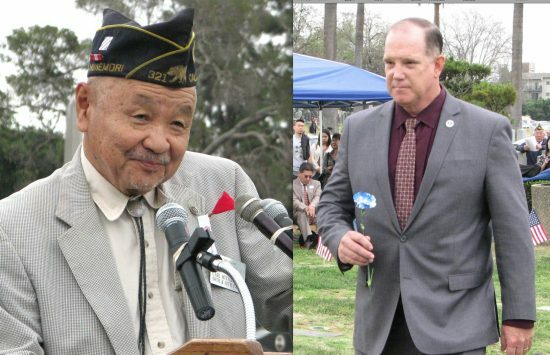 Left: Carl Miyagishima of Sadao Munemori Memorial Post 321 served as emcee. Right: Vince Beresford, the new president/CEO of Go For Broke National Education Center, participated in the ceremony for the first time. Keith Kawamoto led the Pledge of Allegiance, Jerry Yamamoto introduced the keynote speaker, and an honor roll of the deceased was read by Kei Ishigami and Kawamoto. Following is the keynote address by Judge Vincent Okamoto, a Vietnam veteran, recipient of the Distinguished Service Cross, and inductee of the U.S. Army Ranger Hall of Fame. It’s been said that memories are the bridge that allow us to span the gap of time and to reconnect and commune with those special people no longer with us, and to think about what was and what might have been. Memories evoke images of my own family. I was the 10th child and seventh son born to Japanese immigrants. All of my six older brothers served in the military, the eldest with the famed 100th Infantry Battalion during World War II. Another brother served with the fabled 442nd Regimental Combat Team. Another brother volunteered for the Marine Corps and fought in the Korean War. They were my boyhood heroes and I couldn’t wait until I was old enough to follow in their footsteps. I dreamed boyhood fantasies of going off to war and performing deeds of derring-do on some shell-swept battlefield, and having proved myself in combat, returning home, wise in the ways of the world and having earned my right to stand with my brothers as an equal. After college I went into the Army and volunteered for Vietnam, and there all the naïve, romantic concepts I had as a boy were quickly dispelled by the ugly realities of war. Vietnam was a different world, a special universe with its own rules, heroes and villains. There was no glory or glamour in the jungles and hedgerows of Vietnam. It was a lethal, unforgiving land where nightmares became a reality and where I learned the true meaning of fear. After 10 months in combat, having been wounded several times, I was physically exhausted, frayed, and sick at heart. I desperately wanted to live and to go home. At times, I wanted to pull my helmet down over my face and block out the violence around me. I wanted to give up and quit. I believe it’s important for our young people to understand the challenges that our forebears had to overcome. Strangers in an alien land, times of poverty, unceasing toil and racial bigotry. Years when the Issei could not legally own land. When their American-born children were not permitted to live in many areas. And despite abilities and qualifications, they were denied admittance to many professions and occupations. And in California, it was against the law for a man of Japanese descent to marry a woman of the white race. I ask you to remember the dark days of World War II when 110,000 Japanese and Japanese Americans lost their homes, property and businesses and then were banished to desolate desert internment camps. Their only crime — being of Japanese descent. I ask you to remember a time when Japanese Americans were viewed with suspicion and mistrust, and Nisei males were not permitted to serve in the military alongside white soldiers and placed in segregated units — units like the Military Intelligence Service, the 100th Infantry Battalion and the 442nd Regimental Combat Team. I ask you to remember the men of the Military Intelligence Service, whose bravery and language skills as interpreters and code-breakers helped significantly shorten the war in the Pacific. Remember the young Nisei soldiers who shed their blood in a hundred different battlefields in Europe and gained renown in some of the bloodiest fighting in World War II, the 442nd going on to become the most decorated unit in the annals of American military history. Their deeds … reaffirmed the loyalty of an entire people. Remember their younger brothers, who went to fight in the rice paddies and frozen mountains of Korea, determined to emulate the valor of their predecessors. Their sacrifices saved millions of people from the scourge of communism. Remember the chaotic 1960s, when young Sansei were sent off to fight in the sweltering jungles of Vietnam and returned home to indifference or overt hostility. Remember the young Yonsei who fought in the Gulf Wars and endured multiple deployments to the deserts of Iraq and Afghanistan. The great Roman orator Cicero once said, “Poor is the nation that has no heroes, but poorer still is the nation that having heroes, fails to remember and honor them.” Understand that every day of our lives we walk unknowingly among quiet heroes and heroines. A former high school All-American quarterback who turned down a college football scholarship to instead volunteer to fight in the Korean War, where he won a Silver Star for four hours of extraordinary heroism in a place called Heartbreak Ridge. And today, on Veterans Day, pins on his campaign ribbons with a prosthetic hand. A veteran is the old guy holding up the checkout line at the supermarket, now palsied and aggravatingly slow, but who once stormed the beaches of Normandy and helped liberate France. And today spends most of his time wishing his wife was still alive to hold him when the nightmares come. A veteran is a former drill instructor on Perris Island who never saw combat but who helped turn callow youths and street hoodlums into proud Marines, and who saved hundreds of lives by teaching them to watch each other’s back. A veteran is an aging Nisei, a veteran of the 442nd Regimental Combat Team, who never told his grandchildren why he needs a cane to get around and never spoke to anyone about the time his unit suffered over 800 casualties to rescue 210 men in the Vosges Forest in France. A veteran is a man named Hiroshi “Hershey” Miyamura, who received the Medal of Honor for his actions one dark night on a nameless mountaintop in Korea, where he single-handedly held back hundreds of enemy troops in order to provide an opportunity for the other men in his unit to withdraw to safety. Veterans are many of the men gathered here today, each with their own compelling story, each of whom was willing to leave their homes, families, and loved ones and go off to war with no expectation of reward or even a thank-you, but went because they felt it was their duty, and went because someone had to go. In our society some men are lionized for their great wealth, or their political power, or their social position. Some are renowned for their athletic ability. Others are accorded celebrity status as film stars or rock icons. But of all the titles in the world, I think the proudest is that of “veteran,” because it refers to an individual who was willing to give up everything for America. For the families of those veterans, understand that men who go to war are forever changed. They pass through a door through which civilians may not follow. They emerged from the other side of that door sadder but wiser men. Sadder because they suffered the ongoing pain of seeing close friends killed and maimed. They witnessed the death of innocent women and children because they were in the wrong place at the wrong time. And they fought and killed other young men because they wore different uniforms, because they were told to do so, and because those other young men were trying to kill them. But they emerged wiser men because amid the violence and horror of war, they learned just how precious and fragile life is. They learned about themselves, for faced with the mind-numbing fear of death, they were able to overcome that fear by reaching deep down into the recesses of their souls to find courage they never before knew existed, and were still able to maintain their own humanity. What the Issei and Nisei, both civilians and soldiers, accomplished helped shape and mold us into the people we are. What they did allowed us their beneficiaries to live our lives in a better world. So we remember and we honor them. 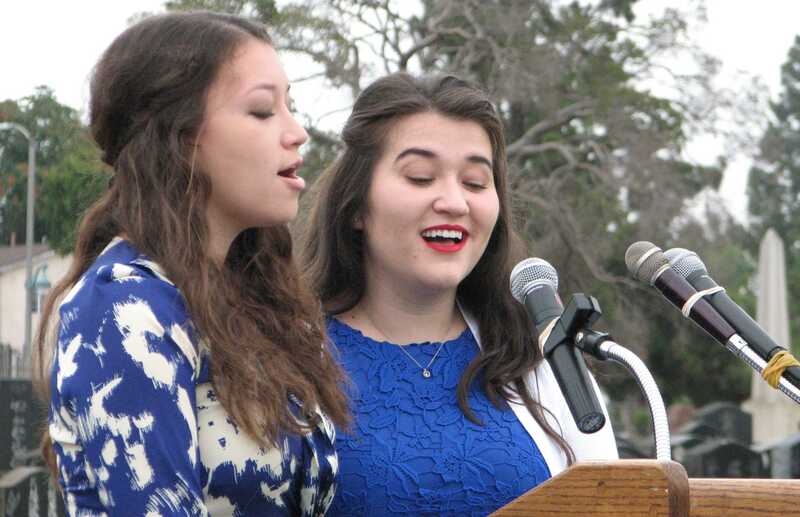 For they bequeathed to this nation ideals that unite all of us as Americans. What they endured speaks to the values that sustain us in times of trial and crisis. What they achieved speaks to the dreams that inspire ordinary people to perform extraordinary acts of courage and self-sacrifice. They speak to us in the value of loyalty, courage, fundamental fairness and personal dignity, and it’s a testament to the glory of the human spirit. These are the things that our Issei and Nisei forebears and our veterans passed down to us. This is our heritage, and by remembering them, they live on.